Prospects of a country in political stagnation – Turkey’s revival on historical ground | Exit or Voice? 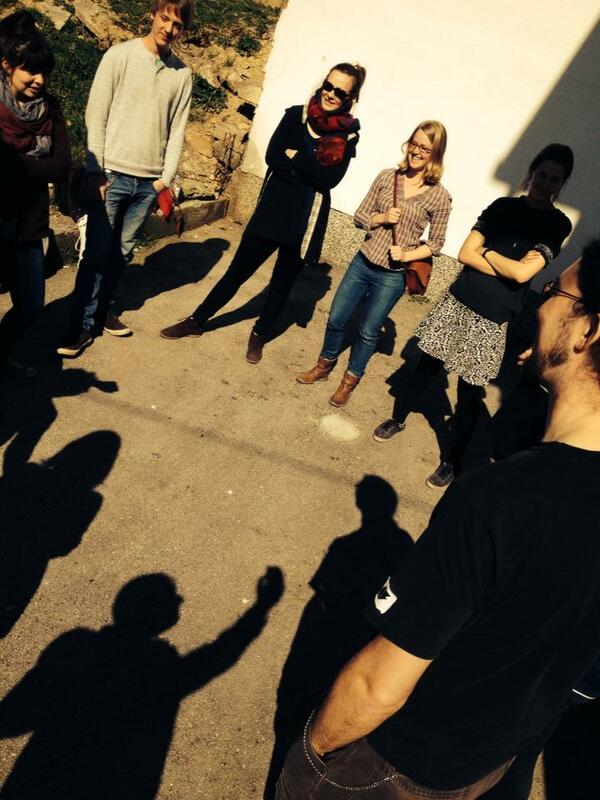 The first day of our journey brought us to the regional bureau of the Heinrich-Böll Foundation in Bosnia & Herzegovina, located on top of the hill near the center from where one has a magnificent view over the old town, the famous baščaršija of Sarajevo. Enjoying the bright sunlight, the vivid discussion with Amela Sejmenovic, the coordinator of the foundation in the capital, acccentuated common concerns and questions that we as a group share concerning the political future of the 20-year old country that has faced a conflictual past nearly unmatched in Europe over the last decades. The main focus of the Heinrich-Böll foundation in Bosnia & Herzegovina lies in Democratization, the strengthening of Civil Society and Empowerment of Women and pushing forward the ecological transformation toward renewable energies. They offer political and economic expertise, initiate workshops and educational programs for judges and lawyers and have taken different actions toward empowerment of the LGBT movement. What has also been clearly articulated during the discussion by Mrs Sukic was the fact that she finds the current political status quo somewhat difficult and that profound changes in organizational structures of the constitution and the role of international actors need to be altered in order to shift the political atmosphere toward a more democratic direction. The direct result of the status quo is the lack of prospects for the population, especially for the Youth that so desperately seeks employment and a future in this country intending to surpass its past that has divided so many people. The question I was asking myself during the few days I have already had the possibility to enjoy Sarajevo was the following: Who are possible actors to fill the social and political vacuum for the youth that lacks an economic and political outlook? And how do these actors communicate within the political sphere, and how does it manifest itself in the public sphere? While I was roaming through the narrow streets of Sarajevo, the apparent signs of Turkish influence caught my attention. Fan scarfs proclaiming the brotherhood between Turkey and Bosnia, the Bosnian cuisine, Mosques which are financed by the Turkish Government, just to name a few of the impressions that I have gathered. Obviously, the influence on Bosnia is of some importance, as not only the Turkish Embassy stands out merely by its sheer magnitude, but also the Turkish Ministry of Tourism which has its main quarter in the center of Sarajevo. Research indicates that two of the biggest universities, the International Burch Univerity and International University of Sarajevo, are supposedly financed and run by Turkish governmental organizations or Turkish educational programs. 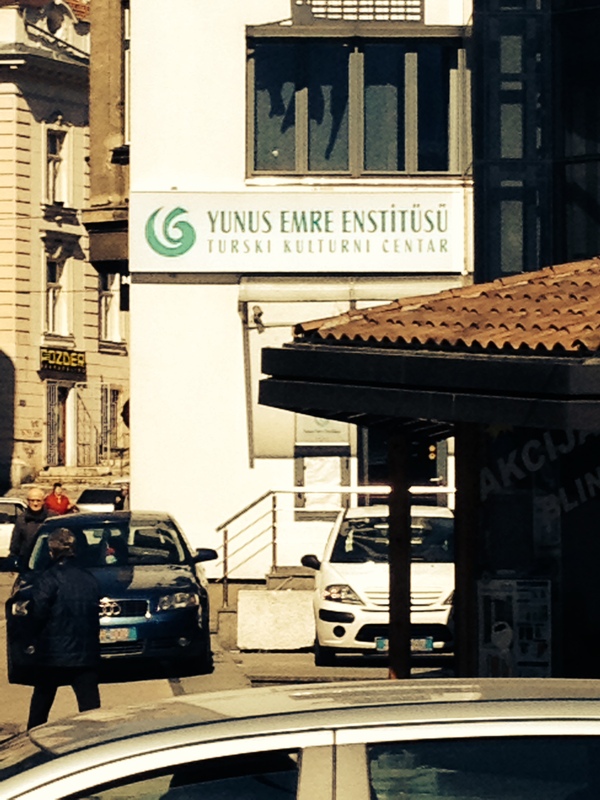 The Yunus Emre Cultural Institute, of which I have not only seen bureaus in Sarajevo, but also in Prizren, Prishtina, Tirana and Belgrade, are widespread and have left their mark in the city that attracts a growing number of tourists visiting from all over Europe. Especially tourists from Turkey, as the bilateral cooperation first and foremost connects people that share a common cultural background and the Muslim Faith, that binds and strengthens their relationship. It would therefore be of great academic interest to further investigate the social impact of Turkish cultural programs, their economic contributions and how the actual existence of these organizations serves as a vehicle for the Bosnian Youth to channel their hopes for the future and to fill the vacuum that the status quo has, unfortunately, created.